Investors increased disbursement as stocks on the Ho Chi Minh Stock Exchange tended to decline on September 23, helping liquidity on the trading floor to return to high level. The VN-Index, a gauge of 256 companies and five mutual funds, shrank 0.69 percent, or 3.13 points, to finish at 450.77 points. There were around 52.22 million shares changed hands at a value of VND1.43 trillion. Foreign investors boosted buying in blue-chip stocks, including PPC, HPG, FPT, DPM, BVH, SSI, and KDC, with an amount of 3.53 million shares worth VND118 billion. There were 36 stocks that gained, 184 fell, while 42 were unmoved. Although Ocean Group Joint Stock Company (OGC) was not in the priority list of foreign investors today, it continued to top the list of most active shares in volume with more than 3.99 million shares changing hands. Investment and Trading of Real Estate Joint Stock Company (ITC) followed with 1.75 million shares, tagged along by Vietnam Export Import Commercial Joint Stock Bank (EIB) with 1.52 million shares traded. Mtgas Joint Stock Company (MTG) and the newly listed company Petro Capital & Infrastructure Investment Joint Stock Company (PTL) were the biggest losers on the city bourse. Both plunged the daily maximum allowed limit of 5 percent to VND13,300, and VND19,000 respectively. Meca Vneco Investment and Electricity Construction Joint Stock Company (VES) dropped 4.96 percent to trade at VND23,000. DESCON Construction Corporation (DCC) retreated for three consecutive days, contracting 4.94 percent to VND23,100. Thien Nam Trading Import Export Corporation (TNA) rose 5 percent to VND31,500. Sacombank Securities Joint Stock Company (SBS) climbed 4.78 percent to VND26,300. The company will issue 13.81 million shares at a ratio of 3:1 and at a price of VND15,000 per share to its current shareholders, not including its major shareholder Saigon Thuong Tin Commercial Bank. From September 22 to October 22, Nguyen The Chuan, father of Nguyen Huy Cuong – deputy general director of Sacombank Securities Joint Stock Company (SBS), registered to sell all 91,500 shares to restructure his investment category. Viet Nam Petroleum Transport Joint Stock Company (VIP) closed up 4.51 percent to VND13,900. 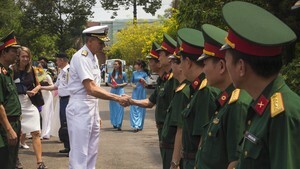 The Hanoi’s HNX-Index slashed 1.7 points, or 1.29 percent, to close at 129.83. Trading volume rebounded by 80 percent in volume and 34 percent by value to 36.7 million shares, worth VND879 billion. The UPCoM-Index inched up 0.25 points to 46.96. 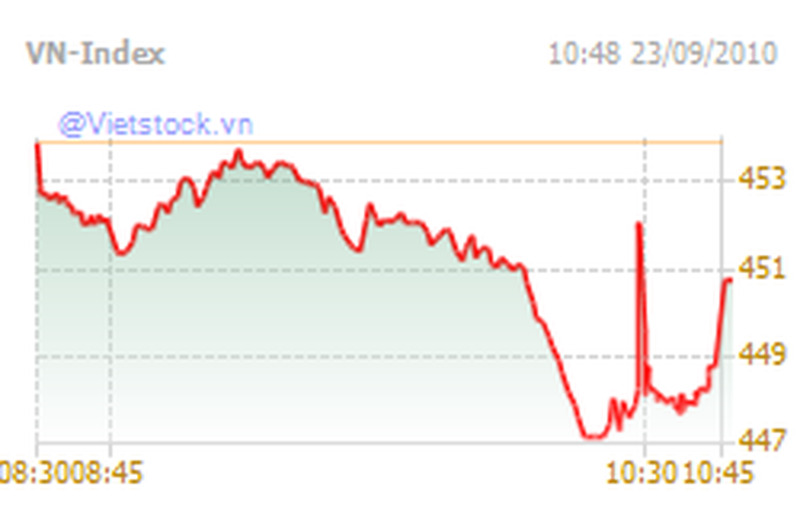 Around 0.54 million shares were traded at VND6.6 billion as of 11:15 am local time.